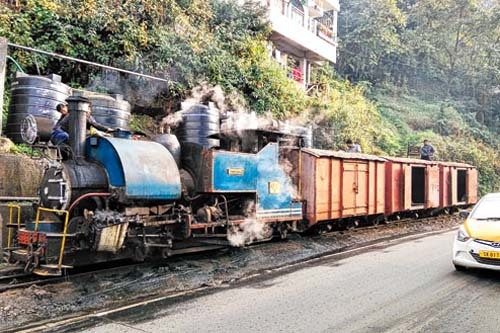 A goods wagon hauled by a Darjeeling Himalayan Railway steam engine chugged into Darjeeling station today for the first time in 25 years. Tindharia O1-B, a B-class steam loco, brought three empty freight wagons after the DHR accepted a request of steam engine lovers from Germany to charter the train. "Last year, we got to know that it was possible to charter freight wagons and we are very proud to have a freight wagon rolling after 25 years," said Peter Patt, who had chartered the ride for a Germany-based tour group called Tanago. "We could accommodate 30 people (this time). We will be back again in March next year." DHR trains can be charted for Rs 57,000 a day. Patt who describes the group as "steam lovers" had booked the train to take photographs and document the wagons. The group has also chartered a passenger train pulled by a diesel engine. "The group started from Siliguri on November 21. The team will travel in the diesel train that would move ahead of the wagon train," said Dipen Thakuri of Clubside Tours and Travels that is co-ordinating the tour. The group that includes people from Australia, Japan, New Zealand and the USA reached Darjeeling last night and left for Kurseong today. The DHR which started operating in 1881 was primarily built for freight traffic to transport tea and other materials from the plains to the hills. "From 1920s, a small four wheel steel van with corrugated roof became the archetypal DHR freight vehicle. Few were specially painted and allocated as luggage vans for passenger trains," said an official. Before the 1920s, open wagons with eight wheels were used. Most of the covered, four-wheel wagons were built at the workshop in Tindharia - the loco that pulled the wagons today is called Tindharia 01-B. "Between 1922 and 1926, 113 wagons were built and another 67 wagons were made in just two years during the Second World War," said the official. The DHR had 606 wagons in 1945. Today, the number is less than 10.